This CD is inspired by the poems created by Merete Atne and a picture painted by Anne-Elisabeth Lien. The music is created while listening to the poems and the last track (Blue Dawn) was made while a picture was painted in the same room. Everything is improvised at my cabin listening to the prerecorded poems and looking out on the sea. It started out very different than the end result with a lot of synthesizer sounds combined, but in the process, it became clear that these tracks were perfect for piano playing. So the recordings were the same, but the sounds changed to piano with keyboards background and a lead synth voice following the piano line. At this time in 2009 I did not have a singer, so I was looking for a new. In different ways 3 singers turned up, and I tried them on different tracks. But in May 2009 Helene Edler Lorentzen arrived in my studio. To my big surprise, she had the perfect voice for this project and my music. Not only did she sing the very low notes as my former singer, but she could also do the high soprano parts!! What a treat! So with Helenes voice combined with the others we finished Piano Poems. The last track, Blue Dawn, also features another singer who also appears on other tracks on other music I have made; Siri Mcalpine. Blue Dawn starts with Siri improvising. Both Siri and Helene improvised a lot on this album. Without any prelistening or rehearsal, they just came up with the most amazing vocal-parts. As with Blue Dawn, Siri’s first take was the one used at the beginning. Piano Poems takes you to in to a inner heavenly ride flying along with the cords of piano and keyboards and the sound from the angelic voices of 4 female singers. music is a true find. His Piano Poems are both incredibly relaxing and highly atmospheric. This is poetry without words. In the relaxation music genre it is hard to make a name for yourself because of the very high number of releases, both in terms of original works and compilations. But when looking at Tron Syversen’s discography it is easy to see that this is a man on mission; his dedication and melodic focus is on par with Chuck Wild and Deuter. His sound design is blissfully uncomplicated, but hidden just beneath the surface is a rare complexity. This is much more than easy listening. Piano Poems starts with the song Come Closer. The song has a wonderful flow and an almost perfect balance of warmth and melancholy. The piano and synth arrangement is equally tasteful. I also enjoy the female voice layering. All songs on the album have a hint of that wonderful lullaby feeling, which adds a warm feeling to the presentation. I especially like that the songs are not too simplistic. Their structure make me think of Debussy or Chopin. Yet at the same time they are instantly accessible, which means that you don’t have to listen through the album three times before you get to know them. That is a major accomplishment. My favorite songs on the album are Freedom Song and You and Me Forever. 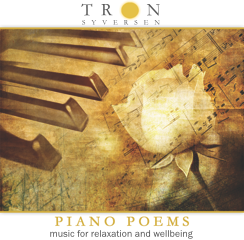 In short; Piano Poems by Tron Syversen is a fantastic collection of melodies for relaxation and quiet contemplation. This is not merely background music. No, this is piano poetry for any occasion.